When you think of energy and sources, what is the first thing that comes to mind? Energy in terms of physical energy? Electricity? Gas? Propane? Natural or renewable sources? Or perhaps non-renewable sources that are becoming rapidly extinct. It can be hard to pinpoint just what it is and what the multiple types are but we all know that the majority of worldwide operations need some source of energy to function at their best. With companies over the globe turning to “green” sources, it is no wonder that natural gas is becoming more common within the industrial world. Natural gas is found within the confines of the earth, but is it a sustainable resource? Yes and no. So, what exactly is natural gas and how does it compare to other energy sources? Let’s find out! Fossil Fuels *coal, propane, etc. 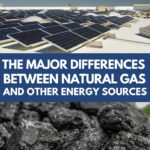 Natural gas falls under the category of a non-renewable energy source because once it is completely used, there is no more to be had or found around the globe. Natural gas is a fossil fuel that is found beneath the top layer of the earth and must be removed through an extraction process, either through drilling using an industrial machine or through a pipeline built partially into the earth. Natural gas is widely considered one of the cleanest fossil fuels in terms of emissions. Cleaner emissions will be translatable to a reduction in long-term health problems, as certain emissions from other sources (coal) can breed asthma or bronchitis in those who are close enough to breathe them in. Natural gas is more environmentally friendly to extract versus other fossil fuels such as coal. Extraction process does require a wide range of trained personnel, from labor workers to environmental engineers. The extraction will create a significant amount of jobs in a struggling economy. Can be controlled through the use of filters and specially designed stacks that will reduce the number of emissions sent into the atmosphere. These filters and filtered stacks will divert the harmful agents into holding chambers to be disposed of properly. Emissions from fossil fuels have been proven to contribute to climate change and leave holes in the ozone layer. The ozone layer is what protects the earth and its inhabitants from feeling the full effect of the sun’s UV rays. Emissions from natural gas can contain a higher-than-average amount of methane, which is one of the most damaging emissions there is. Methane can irreparably damage fragile ecosystems and cause long-term health problems for humans and animals alike. These methane gases can leak into the air during the extraction process and from unstable pipelines. Extraction efforts can release harmful sediments into nearby streams or other water sources, damaging plant and marine life to irreparable levels. Extraction efforts can speed up natural erosion processes, leading to landslides, floods, sinkholes, and other disastrous occurrences. Some other energy sources that are commonly found in a typical industrial setting range from renewable to non-renewable resources. Each type of energy source will fall under one of these categories, so it is important to know the difference. Renewable Energy Source means any source that is in constant supply and will regenerate itself during and after use. Like wind turbines! Solar Highways: What’s it all about?